As a rider, our posture is the bedrock of our influence on the horse, it is what sums up the difference between being a rider and simply a passenger. The rider's postural strength can be likened to the banks of a river which channel the flow of water in the same way that the rider gymnastically channels the horse's movement and power from the haunches straight forwards towards the bit. Before we can understand the relevance and nature of the posture in riding, we need to look at the unique physical challenge faced by any rider who sits on a horse. 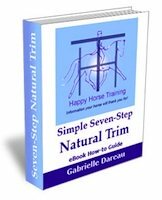 Consider first that when as a rider you step off the ground and onto the horse's back, you have lost your own fulcrum of support (which is normally the stability of the ground) and you now become entirely at the mercy of the horse's movement. Secondly consider that the horse weighs usually around ten times more than you do. If we are agreed that the goal of dressage is not only to gain full control over where the horse takes us, but also to fundamentally alter his way of carrying himself, and if (a very important 'if'!) we have decided to do this without making the bit our fulcrum of support (see The Independent Seat) then logically there must be some powerful characteristic we need to develop in our body that could allow us to achieve this influence over the horse. The answer is the development of the posture: the cohesive strength that allows us to maintain our body in a particular configuration when confronted with the strong forces the horse's movement exerts on us. 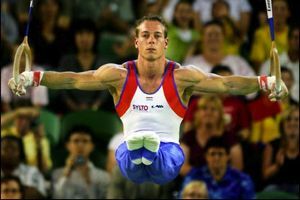 Have you ever watched an accomplished gymnast performing on the rings? It looks like he is suspended in the air in total defiance of gravity. This control is in fact achieved by immense postural strength, and in riding it is a similar control we need to acquire if we are to genuinely channel the horse into engagement with our body, and not just control him superficially with the bit. There are various ways in which the rider's postural strength is needed to alter the horse's natural way of going, and bring about engagement. 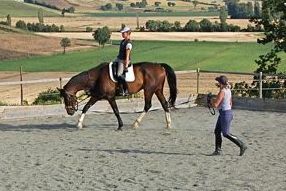 When an engaged horse moves, the thrust of each hind-leg is transmitted straight forwards through the horse's body, via the stretched back muscles, towards the bit. The hollowing of the horse's back which results in a loss of hind-leg thrust energy in a backwards direction (the horse pushed out behind, instead of stepping under his body and pushing through his back) shown clearly in this picture (right). It is the job of the rider to use their body to limit these two main losses of forwards transmission in the horse's movement, because when there is enough transmission, engagement on the ring is the inevitable result. The only way as a rider you can prevent this loss of transmission from behind is to connect your body with the movement and then posturally resist both the rotation of the rib-cage when each hind-leg pushes-off, and the pushing out-behind of the horse's pelvis that goes along with a hollow back. You cannot 'teach' the horse cognitively through signals to channel his body in this way, nor can you achieve it by holding onto the bit and prodding with spurs. The only way is through strengthening your posture so that your body is cohesive enough to be capable of staying in the right place - the place that is conducive to engagement - instead of being pushed around by the horse's movement. Once you have this structure in place in your body, then of course you use your aiding to guide the horse into correspondence with it. But if the horse is pushing your body from side-to-side with his ribcage, and tipping your pelvis into the position that corresponds with a hollow back, then it doesn't matter how much you work on perfecting your aiding - on its own it won't stand a chance of channeling the horse correctly. How Does the Rider Build the Correct Posture? A great deal of the postural strength of the rider is in the core muscles. This is because these are the muscles used to control the position of the pelvis, and the pelvis is the rider's main interface with the horse's movement (see The Independent Seat). 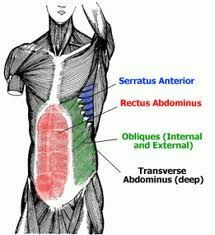 So the rider need to become aware of what the right position is for the pelvis, and then build the muscles that keep it in this position: the core muscles comprised mainly of the rectus abdominis, transverse abdominis, and the obliques. The rider builds these muscles by his interaction with the horse's movement, but it is sticking to the the correct basic position that makes this interaction happen in the right way. If you allow the horse's movement to displace your body out of the right position, then you will no longer connect to the movement in the way that builds up your posture and core strength. This is why work on the lunge is so important for the rider's training, it gives the opportunity to concentrate solely on this correct interaction with the horse's movement to build postural strength. This extra concentration is essential because putting yourself in the position to build these muscles is a real challenge to begin with. Because the postural cohesion is weak initially, the rider often feels unstable, and as if they have relinquished their previous way of controlling the horse. Of course this is a necessary process in order to build a deeper and stronger connection eventually. The other obvious benefit of working on the lunge is the instruction (ideally) focused on your position. Since our perception of our body when we are riding is very often distorted by all of the forces of movement we are dealing with, it is extremely helpful to have an expert eye to make corrections. However just learning some basic facts about how you need to sit can get you on the right track, and then the right reactions in the horse can go a long way to instructing your riding if you are committed enough.If you set engagement as your goal, then as soon as you get a feel for it through moments when everything comes together, you can let your intuition guide you in the right direction. The more you increase your bodily awareness, the clearer this intuition will become. Unfortunately there are a great many misconceptions about how the rider should sit on a horse and use their body. This may be because few riders push through to achieving true control of the horse through their posture. With many different combinations of riders and horses working on the lunge, we have studied how the rider's position and posture actually affects the horse's way of going without any confusing interference from the reins (or tight side-reins). 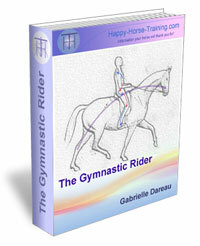 The keys to what the correct position actually is, and how to go about achieving it, will soon be available in the Happy Horse Training e-course The Gymnastic Rider. When you strengthen your posture in the right way, you bring about a transformation in the horse which also strengthens his posture. You will notice the same muscles building in your horse as yourself - exactly the same abdominal groups. 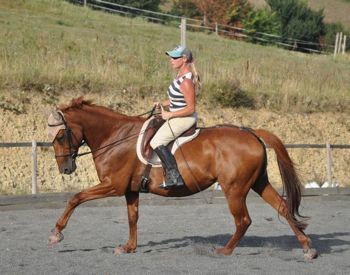 Your horse's ribcage will even begin to take on a different shape with enough work in engagement - flatter on the sides, and more solidly connected to the pelvis between hip and stifle due to the effort of channeling the hind-leg thrust straight forwards. The abdominal muscles under the belly will also strengthen significantly as a result of the horse tucking his pelvis and lifting his back, and of course, the important muscles at the back of the haunches which corresponds to the rider's rear thigh muscles, as well as the second thigh muscle which builds in the same way as the muscle to the outside of the rider's shin. Once you have initiated this positive circle, then the more the horse develops a strong posture, the easier its becomes for the rider! Eventually, you will no longer have the impression you are trying to move mountains every time you ride, but along with your horse, you will still work out and maintain each others postural strength through the unique dynamic connection of engagement.